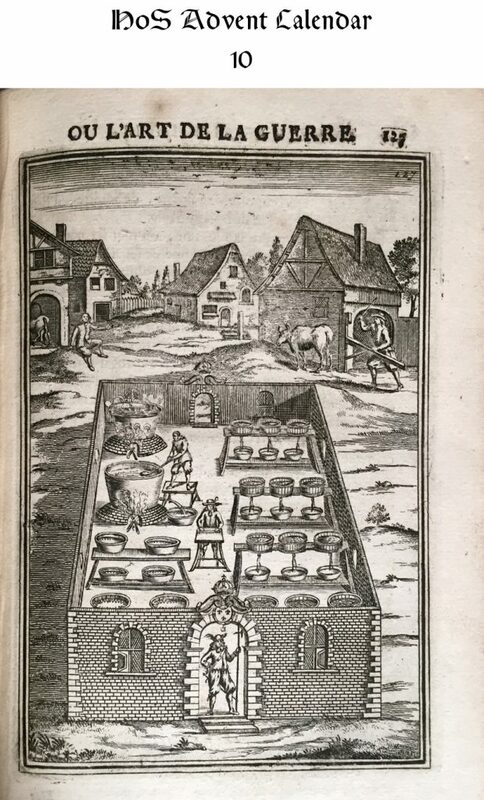 Engraving from Les Travaux de Mars (1696) showing workers separating and purifying saltpeter. In the late 17th century Allain Mallet published a three volume work Les Travaux de Mars, ou l’Art de la Guerre , illustrated with dozens of engravings showing all aspects of warfare. He includes chapters on different fortress designs, the benefits and drawbacks to them, and their construction. There are chapters on encampments and engagements. Chapters on military maneuvers and formations, as well as chapters on surveying battlefields. He includes chapters on the construction of cannons and the manufacture of ordinances. Nearly every chapter is illustrated with a fine engraving. This engraving illustrates the chapter on the manufacture of saltpeter, the principle ingredient in black powder. He opens by describing the ideal places to find saltpeter—humid places like caves, cellars, and stables. He discusses how to tell if the soil will be rich saltpeter and how to separate it from the rest of the earth. He then explains how to purify it to produce the most useful and powerful powder. This engraving workers purifying the saltpeter. The stables in the background are probably meant to illustrate where saltpeter-rich soil was typically found.